The most majestic, small and elegant cat, the Clouded Leopard. With teeth the same length as a fully grown tiger, the Clouded Leopard has the longest proportioned teeth, second only to the Sabre Tooth Tiger. African and Amur Leopards can climb trees with ease, but this smaller, more agile cat completely puts them to shame. The Clouded Leopard is the only cat that can climb along branches upside down and climb down trees head first, turn around and go straight back up without touching the floor. 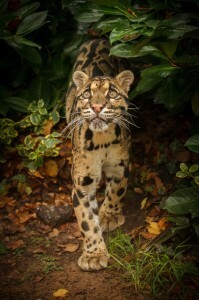 The Clouded Leopard lives between the Himalayan region and China. In 2008 IUCN (International Union for the Conservation of Nature) declared the status of the Clouded Leopard as vulnerable with a population of adult cats to be less than 10,000 in the wild. The first time I visited the WHF (Wildlife Heritage Foundation) big cat sanctuary, this cat would not come out to play. So on my next visit, I was not expecting to see one again, but to my good fortune not only was I graced with one Clouded Leopard but two. Until this encounter the African Leopard was my favourite big cat, but the markings and the pure beauty of this beast has completely captivated me. We need to do everything in our power to stop poaching of these animals for their coats, and protect their valuable habitat and just maybe our next generation will be able to see these in the wild, not just in captivity. This entry was posted in UK. Bookmark the permalink. Follow any comments here with the RSS feed for this post. Both comments and trackbacks are currently closed.